Brewers’ Pale Ale Citra Hop Blend, a crisp and quaffable American Pale Ale packed with citrusy hop flavor, is officially on shelves now! Brewers’ Pale Ale is an evolving hop series brewed by brewers, for brewers. And now, Anchor is proud to share this second rendition with our beloved beer community. The Citra Hop Blend of Brewers’ Pale Ale is a refreshing, easy-drinking pale ale with bright aromatics of tangerine, Meyer lemon, and melons. While the first version of Brewers’ Pale Ale highlighted the unique Nelson Sauvin hop from New Zealand, the Citra Hop Blend possesses a more citrus-forward flavor profile with notes of pine in the background. 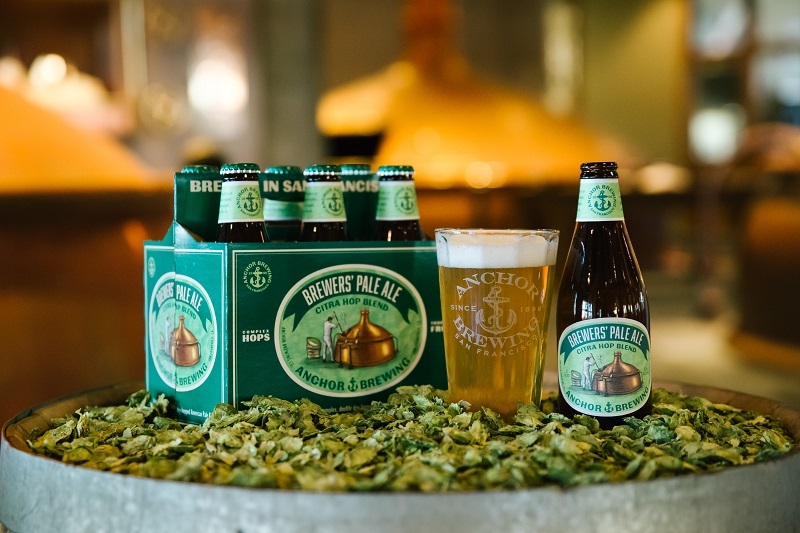 Anchor’s team of brewers will continue to experiment with their favorite hop varieties in the Brewers’ Pale Ale series, releasing new hop blends periodically. The malt bill, alcohol, bitterness and brewing process stay consistent, but each new blend has unique flavors and aromatics. A supporting cast of hops work together to highlight the citrus flavor profile; Cascade, El Dorado and Eureka. “Cascade hops accentuate the lemony notes. Eureka contributes a lingering taste of pine, while El Dorado adds a touch of melon flavor,” said Ungermann. Brewed with 2-row pale, red wheat, pilsner and acidulated malt, Brewers’ Pale Ale is a tasty, aromatic beer packed with complex hop flavor. The Citra Hop Blend pours a bright golden straw color with a creamy white head and nice lacing. Not filtered to intense clarity, it has an intentional slight haziness. It finishes fairly dry with a nice balanced drinkability, making it a beer to enjoy any time of the day. The second rendition of Brewers’ Pale Ale pairs perfectly with ceviche, lime and fig chicken and risotto with seared scallops. 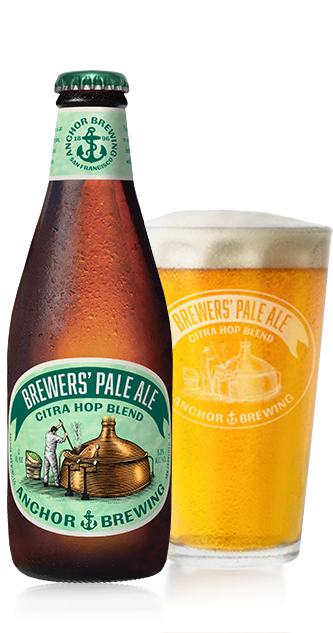 Brewers’ Pale Ale Citra Hop Blend is available now in 6-pack bottles and on draught at select bars, restaurants and stores as well as at Anchor Public Taps and the Anchor Brewing Taproom in San Francisco. You can find a brew near you by using the Anchor Beer Finder. This is seriously the best beer I’ve ever had in my life. Also, I have never left a review of any product of any kind- ever in my life- but once this delicious beer hit my lips I was blown away. So much so, that I reluctantly have decided to leave a review. Please never stop brewing this.